A guide to second-hand clothes shopping at University. I, like the majority of students at university, try my very best to look good. I wouldn’t say I’m someone who is ultra -appearance conscious, but I do take pride in how I look. Putting together a great outfit is definitely an important factor in boosting self-confidence; not just through others acknowledging your look, but also through you honing in on some self-acknowledgment. There’s no better feeling than setting foot in Alexandra Square wearing your fresh, new get-up, and knowing that you’re absolutely rocking it. However, sourcing such a banging look is a rarity if you have a ‘crying-out-for-help’ bank balance like the most. But, this does not mean you have to settle for years-old clothes. Obvious alternatives find themselves in cheap high street stores – and this is a very solid option. I’m no fashion snob, so purchasing from the high street is not something I turn my nose up at. High street collections are ever-improving, and it is possible to find really cool, versatile items pretty much anywhere now. Although, I do personally boycott Primark for a number of reasons, and I’m pleased to say that I haven’t bought more than probably two items from there throughout my whole life (and I think even both of those were simply for fancy dress). Primark pockets millions from people being unaware of the vast alternatives that exist. Second-hand shopping is my favourite substitute, and far over half of my wardrobe is pre-owned. Obviously, this is partly due to the financial gains that are made from shopping this way – but this is also where you find the genuine gems that the high street wouldn’t have the guts to sell. Lancaster as a city is very small, so it is harder to find vintage clothes in a great variety. Still, charity shops are the original source of second-hand clothes, and were around way before vintage clothes became the contemporary. Nevertheless, the demand for the old-fashioned has now bumped up the prices in vintage stores, and made them less accessible. Of course, charity shops aren’t always helpful with their many rails of long-gone grandad knits. Browsing in a Lancaster charity shop, I was once met with a half a rail of Asda George polo shirts: all of identical style, all in different colours. Yet, I did not let this comical arrangement put me off what I knew could be found. Charity shops are perfect for finding shirts. I’m a huge fan of quirky, baggy shirts; it’s what I tend to wear most days, especially unbuttoned with a plain t-shirt underneath. Pretty much any old-fashioned looking, oversized shirt you can get your hands on can be a functional piece to liven up any wardrobe, and be appropriate for the everyday. 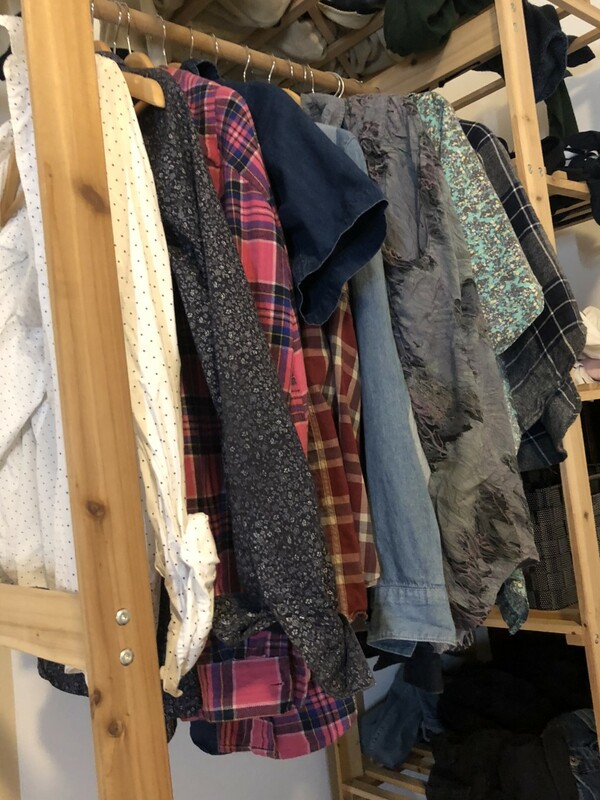 Most good charity shops will only charge between £1-£5 for a shirt, so it’s tempting to buy a lot, but admittedly they can become rather samey if you don’t vary your styles. I once came across an old, vintage Armani short-sleeved shirt in Lancaster’s Cancer Research shop for only £3 – my proudest bargain. I came to Lancaster from Manchester, which is the ultimate dream if you like vintage clothing. Huge numbers can be found around the city, but the best can be discovered specifically in a small vicinity in the Northern Quarter. As you can imagine, having lived with this, I was quite disappointed to see Lancaster’s lack of vintage shops, but Manchester is only a short train journey away. Vintage shops are generally a lot more expensive than other options, but I have found some of my favourite apparel in them. My wardrobe’s front-runner is an oversized, blue-patterned, flowy shirt which I bagged from COW. I’ve worn it so much that both cuff buttons have fallen off. 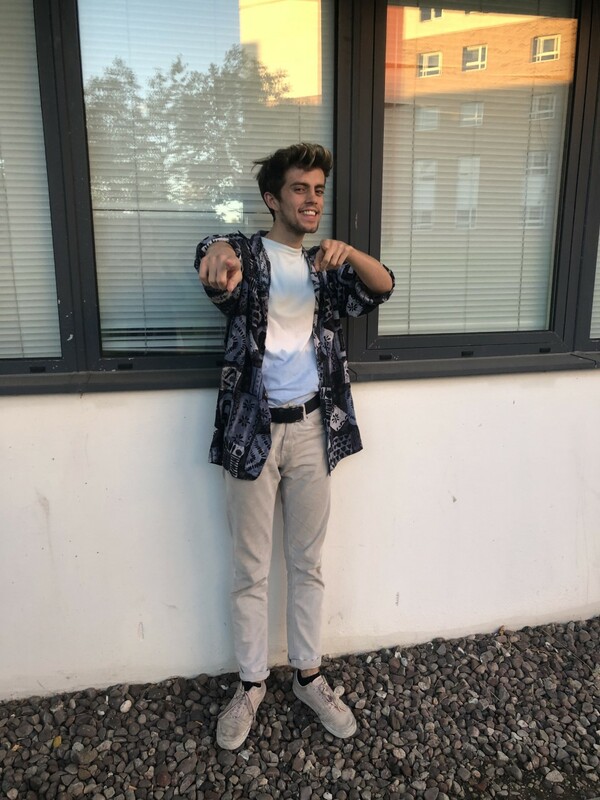 Lower quality as a result of being pre-worn, is a disadvantage of second-hand clothing I guess, but that’s all part of the vibe. I once bought a shirt knowing that it had a large rip down the arm. Lancaster has some fantastic vintage sales, which usually arrive a couple of times a term. They either take place in the Town Hall or in the University of Cumbria. 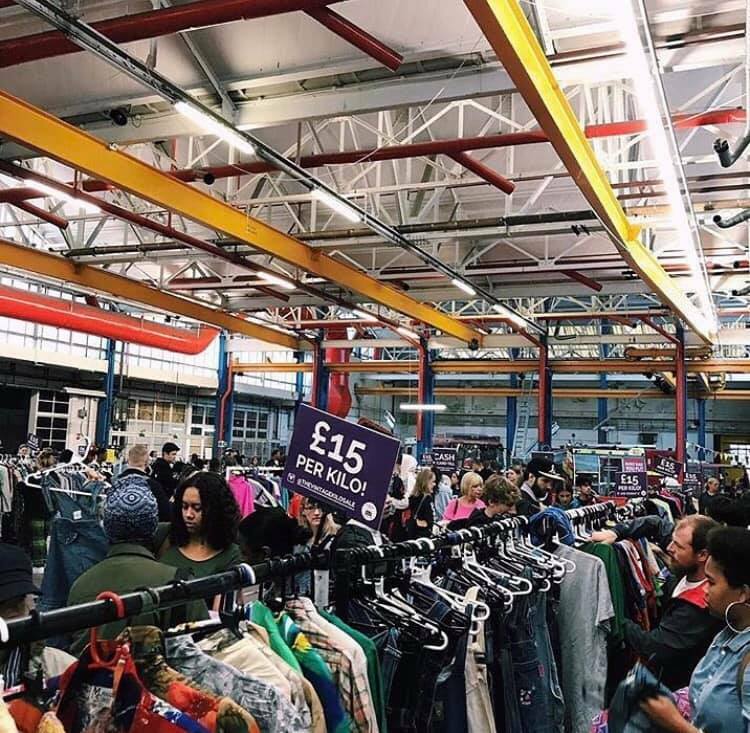 The perfect kind of vintage sale is the kilo sale. This proves to be ridiculously cheap as each item is priced at how they weigh; at the last pop-up it was around £16/kilo. This means items like a t-shirt can work out as low as £1 or less – amazing for the student budget! In the last kilo sale, I found a really trendy, burgundy corduroy shirt, in addition to a beautiful silk, short-sleeved patterned shirt. eBay shouldn’t seem like an outdated option nowadays. If you have a particular item in mind, eBay still holds firm significance, especially for specific designer items. I bought some cheap white Converse trainers from there; these types of shoes are such a summer-essential, and go with just about anything, and the chances that someone around the world are selling some Converse in your size is more likely than you think. Likewise, I have also purchased a pair of very cheap beige cord trousers, which have energised my wardrobe from the usual, classic black skinny jean. A controversial app. The majority of finds lean closer to the more vintage, labelled end. Personally, I like the Depop format because you have the ability to follow particular sellers who have a similar dress sense to you; not only does it provide you with clothes choices you are likely to buy, but also gives you plenty of style inspiration. I bought some pale blue denim dungaree shorts from Depop, which quickly became my favourite for the summer months. I also managed to bag a huge bargain in a Levi’s camel fur-trimmed denim jacket for only £20, and that has lasted me for years. On the other hand, there is the potential for a conning from Depop sellers, as an item I once ordered came far smaller than what was advertised. No surprises that when I went returned to the app, I was soon after blocked from her profile after she realised her error. In turn, this becomes a huge downside for the fashion app, but it does hold substantiality for its usefulness in finding expensive labels for cheaper. Next articleCan you be political without a party?